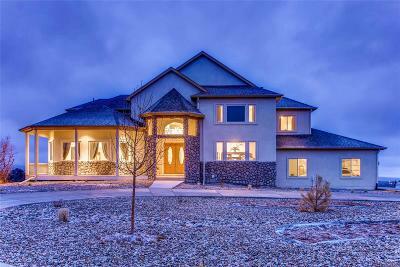 Keene Ranch - Keene Ranch, located 5 miles south of Castle Rock, is a custom home, acreage community that allows horses. Home sites average 5-to-7 acres with some sites as large as 35 acres. All of the home sites are designated horse property. 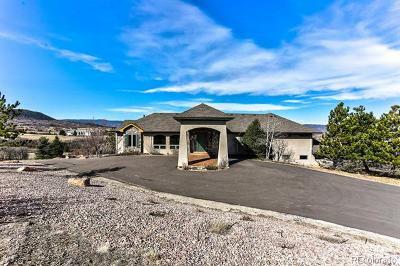 You will find breathtaking views of the Colorado Front Range, paved roads, underground utilities and miles of equestrian trails in this prestigious neighborhood. Keene Ranch is located halfway between Denver and Colorado Springs so you can enjoy the opportunities that the big cities provide, yet have the convenience of Castle Rock just a few minutes away. Keene Ranch has an impressive 16-mile trail system that winds throughout the community. The trails which are reserved for the exclusive use of property owners and their guests are common property intended for pedestrian and equestrian use only. They are 50 feet wide within the development and 25 feet wide along the periphery. Trail markers are placed throughout the development to guide you. You can also spend a day playing on the greens at the award winning Golf Club at Bear Dance or hiking in the Pike National Forest - both just a few miles away. If you are seeking privacy in a scenic setting, you have found it in Keene Ranch, Colorado. Keene Ranch is convenient for commuters located 5 miles south of Castle Rock, just off I-25. Approximately 20 minutes from the Denver Tech Center, E-470 and Park Meadows and only 40 minutes from downtown Denver or Colorado Springs.